No diving experience is required for a guided underwater exploration off St. Thomas with The BOSS - a Breathing Observation Submersible Scooter. 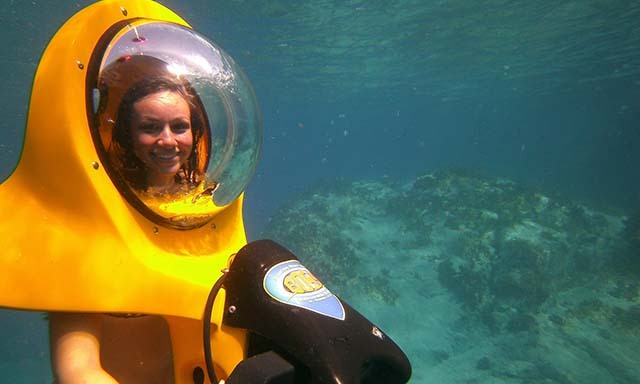 While driving this unique vehicle, an oversized helmet allows you to breathe normally, and offers unobstructed views of the tropical reefs and colorful fish. While others take their turn, enjoy snorkeling in the clear waters. Travel in style to and from the dive site onboard a 60-foot dive yacht. • Underwater Scooters: Special vehicles with oversized helmets let you see colorful marine life. • Scenic Cruise: Relax on spacious sun decks enjoying views and the breeze en route to and from the dive site. • Onboard Amenities: Enjoy snacks and refreshments on the 60-foot vessel, which is equipped with fresh water showers and bathroom facilities.